As the saying goes, “Hope for the best but prepare for the worst,” is a good rule to follow when wearing a suit. Hopefully, nothing will happen to your outfit while you are wearing it, but there’s no way to predict the future. Maybe you develop a stain on your shirt, or perhaps your trousers develop creases. Regardless, you should consider carrying an emergency kit when wearing a formal suit. By including the following items in your suit emergency kit, you can rest assured knowing that you are prepared for whatever the day has in store for you. Why should you pack your dryer sheets in your suit emergency kit? Dryer sheets do more than just deodorize and freshen garments; they reduce static cling. During winter, you may discover static electricity on your suit jacket, trousers or dress shirt. When this phenomenon occurs, the respective garment or garments will attract fuzz, causing it to stick to them. Although there are many ways to eliminate static cling, using a dryer sheet is arguably the easiest. Simply rub a dryer sheet across the surface of your suit jacket, trousers or dress shirt to instantly eliminate static cling while leaving your clothes smelling nice and clean in the process. Assuming your dress shirt doesn’t already feature links in the cuffs — the area of fabric around the wrists — you’ll need to wear cufflinks with them. This otherwise basic accessory allows you to secure the cuffs of your dress shirt together so that they aren’t loose. And while a single pair of cufflinks should suffice for most men, it’s not a bad idea to carry a spare set in your suit emergency kit. If you lose or damage your first set of cufflinks, you can replace them with the spare set. Without cufflinks, you won’t be able to create a cohesive, formal appearance, regardless of the quality of your suit and accessories. It’s always a good idea to carry a can or jar of shoe polish when sporting a formal suit. Conventional wisdom should lead you to believe that dress shoes, such as loafers or Oxfords, are ideal when wearing a suit. But they’ll only help you achieve a complete look if they are polished. If you happen to scuff your dress shoes, they’ll look dingy and degraded. A quick fix that takes just a few minutes, however, is to apply a layer of a polish. Featuring a cream or liquid consistency, shoe polish is designed to hydrate and restore formal footwear back to their original appearance. Applying just a small, thin layer of polish to your shoes can make them look years younger, thereby enhancing your overall appearance. Like cufflinks, a single necktie should suffice when wearing a suit. But if you’re looking to cover all your bases and protect against unforeseen wardrobe malfunctions, you should consider bringing an extra necktie. 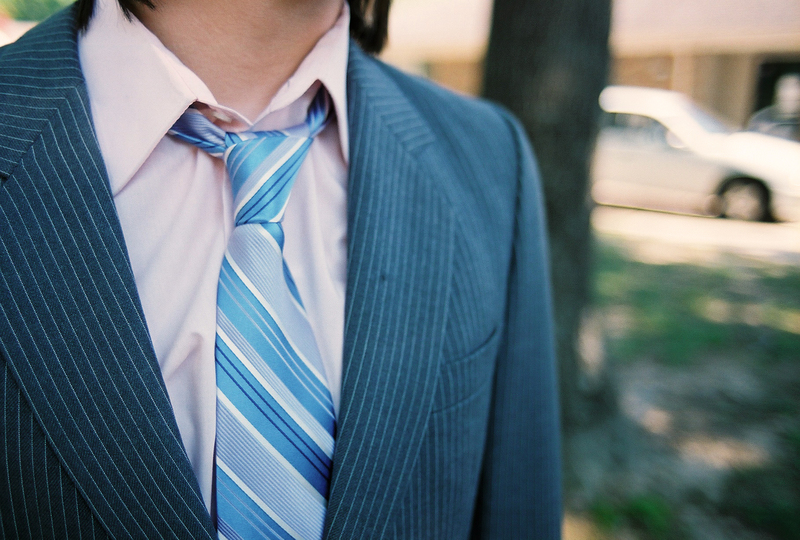 Because it’s worn directly below the neck, neckties are highly susceptible to stains. You may accidentally spill your morning coffee on it, or you may get ketchup (or other condiments) on it while wearing. Wardrobe malfunctions such as these can be avoided by bringing an extra necktie. If you discover a stain on your necktie, simply go to the bathroom and replace it with your spare necktie. Just remember to bring a second necktie that matches and flows cohesively with the rest of your outfit. Otherwise, it won’t be of much value to you. Whether it’s on your necktie, suit jacket, trousers or dress shirts, stains are bound to happen. If you bring a spare necktie, though, you can easily replace your stained necktie. But what about your suit jacket and trousers? For these garments, it’s recommended that you bring stain-removing wipes. As the name suggests, these wipes contain a special formula of ingredients to clean and remove stains from common fabrics. You don’t have to wash your stained suit jacket or trousers. Rather, use the stain-removing wipe on the affected area of the fabric. If the stain is superficial hasn’t “set” into the fabric yet, this should remove them. It’s also a good idea to pack a bottle of de-wrinkle spray. Also known as wrinkle releasing spray, this product can reduce or even eliminate wrinkles on your suit jacket, trousers or dress shirt. Wearing a wrinkled suit is never a good idea. It creates an awkward, messy and unflattering appearance that most men want to avoid. Thankfully, you can protect your outfit from wrinkles by using a de-wrinkle spray. Just spray the product over your suit or shirt, at which point it will smooth out any wrinkles or creases. Don’t forget to pack an extra pair of dress socks in your suit emergency kit. It’s not uncommon for dress socks to rip or tear, especially if they are old. If this damage occurs in the upper part of your socks, it may be visible to other people. Therefore, you’ll need to replace your dress socks with a new pair. By packing an extra pair of dress socks in your suit emergency kit, you can cover scenarios such as this to ensure that it doesn’t hurt your appearance. Last but not least, a sewing kit is an invaluable item to carry when wearing a formal suit. Even if you have little or no sewing experience, you can still use this kit to repair torn seams, missing buttons and other common problems. Sewing kits typically contain a variety of sewing needles, as well as thread and buttons. If you’re in a bind and discover that your suit jacket or dress shirt is missing a button, you can use this kit to repair it. Of course, taking the garment to a professional tailor is probably the best solution, but this is a quick and easy way to repair your garments on the fly.